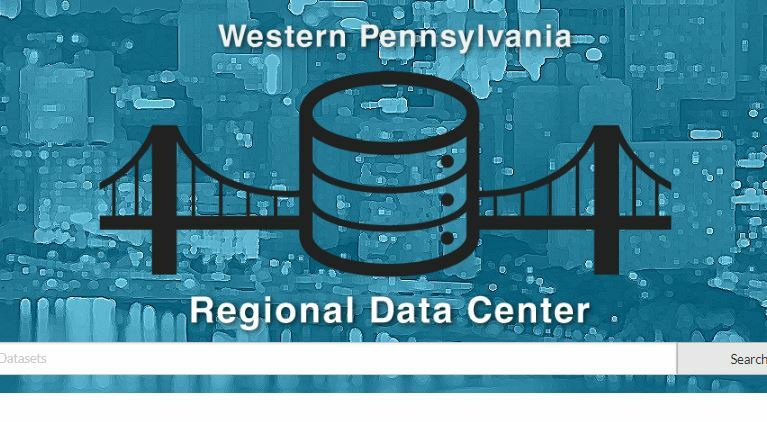 Back in the summer of 2015, we developed our initial website in anticipation of the launch of the Western Pennsylvania Regional Data Center’s open data portal and project website. Our initial site design enabled people to search for data they could download, and learn more about our programs and services. Through conversations with our users, informal user tests, and performance management statistics, we made our first round of site improvements in 2016. These improvements focused on adding maps and data visualizations to our dataset landing pages. In the past year, we expanded our products and services to include data guides, tools, events, and our bi-weekly newsletter. Unfortunately, the design of our previous website did not enable our users to easily find out about our new offerings. It became frustrating that the design of our website prevented people from making use of our work. We are not user experience designers by any means. This was clearly apparent to anyone who used the initial version of our site. We needed professional guidance, so we engaged local web developer Patrick Fulton to develop a user experience strategy for us. He reviewed our website analytics, conducted a content audit of our existing site, reviewed the design of other open data portals for inspiration. He also conducted a series of interviews with stakeholders and with beginning and experienced data users. The knowledge gained through this work was incorporated into his design suggestions, and it was also good experience to see how a web professional approached our challenge. Our former homepage was dominated by a large “coffee can” graphic and search bar. None of the other content we sought to highlight (events, data guides, newsletters, blog posts, etc.) were easy to find without a lot of scrolling or clicking into the menus. The navigation of our site was unclear. Content was divided across far too many pages and menus, and some of the best material was buried under a second layer of menus. The “showcase” items and other tools that make data more accessible were far too difficult to find. These were buried under the “data” menu in our former design. The site could be intimidating for all but data experts. Although our legal counsel insists on the click-through interstitial “terms of service” page, the design of the page presented a barrier to users. Many visitors to our site would leave after being unexpectedly presented with the terms of service in a stand-alone webpage. Our team then used the design recommendations as a guide. We built our new website and wrote our new content in-house. Here are some of the changes we made to address the shortcomings of our old design. Our brand new homepage was completely redesigned to serve as a portal to key content. The search bar was de-emphasized. The new design points out key points of interaction, including our newsletter, events calendar, and technical assistance services. Inspired by the design of New York City’s open data portal, we provide clear points of entry for three key audiences: beginners; wizards; and publishers. We have greatly streamlined our menu structure, and are now making use of landing pages to present content. Please see the beginner landing page for an example of how we have simplified navigation. We are also using expandable widgets and buttons to minimize the need for adding new webpages. The FAQs for beginners page provides an example of how we provide valuable content while minimizing complexity..
To highlight many of the great tools available to help people use data, we call attention to them with an icon on our home page and in their own “tools” menu. 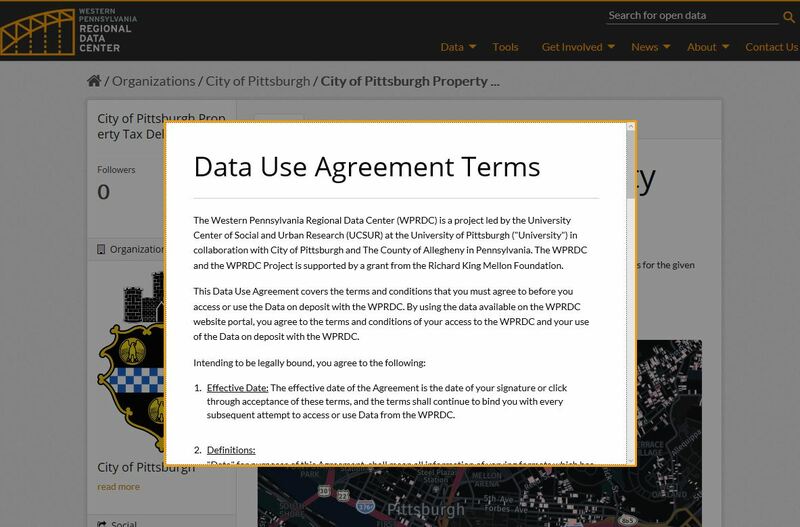 Drawing inspiration from Open Data Philly, our tools are also subtly featured near the top of our home page in a rotating image carousel. We redesigned the terms of service page to appear as a window in front of content the users want to access. We are unable to remove it entirely, but wanted to show users that the content they’re seeking exists and can be accessed once the user agrees to the terms. We launched our new website on August 25, 2017 but we’re still not finished. In accordance with our agile development philosophy, we are making ongoing improvements and bug fixes. Some of the newest improvements you’ll see in coming weeks include additional tutorials for beginners, and the inclusion of more and more data tools to the tools page. We also plan to review our website analytics and performance statistics to learn more about how our new design has changed our users’ experience. We will conduct additional user tests to gain additional insight, and make improvements based on feedback from our users. We’ll also do some thinking about how we can use our website to capture stories from our data users. As always, we welcome your feedback. Let us know what you think about the new design, and feel free to share any ideas you have for making it even better.